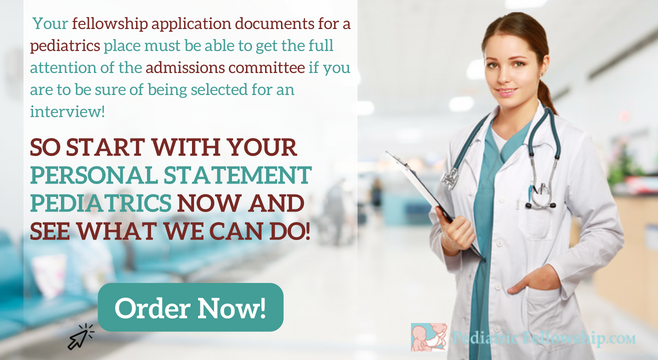 Why Does Your Pediatrics Application Need to Be Outstanding? Getting the fellowship place that you want is no easy matter. You will be applying through ERAS and the Fellowship Match and unless you are able to truly make your application stand out from the many other applicants you will find it hard to get an interview or to be ranked highly. 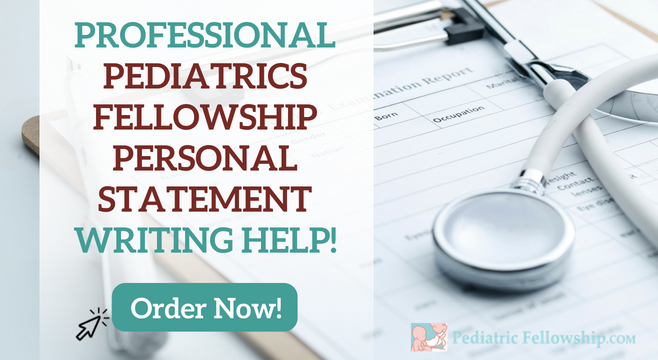 Your fellowship application documents for a pediatrics place must be able to get the full attention of the admissions committee if you are to be sure of being selected for an interview. However, writing a perfect set of application documents for your pediatric fellowship program is far from easy task. Many applicants struggle with understanding just what is expected of them within their personal statement and resume. Often applicants fail to tailor their application to show just how well they match the program requirements or they fail to write their documents in a way that is going to get them noticed. We provide our clients with professional support that will help you to ensure that your application will have the greatest chance of success. We provide you with support through staff that are highly experienced with applications and fully understand just what the committee will be looking for. We work directly with you to ensure that your documentation will be carefully tailored to the application that you are making. Our experts provide you with unique writing that will get their full attention while showing you off in the best possible light. We fully guarantee that you will be fully satisfied with the help that you receive and will be able to make your application confidently with our support. Pediatric personal statement writing: our writers are carefully selected to ensure that you will be working with an expert that will know just what is expected from you. They work one on one with you so that they are able to draw out the most relevant and impressive information that is required for your statement. All writing that they provide will be tailored to the application and produced from scratch without any plagiarism. Your statement will be attention grabbing and not simply created using a generic template as some other services do. Pediatric fellowship resume writing: just as when you are applying for a job you need your resume to clearly show with just a quick review that you perfectly match their requirements. Our experts help you to identify the specific requirements that are expected of you and will then help you to match your personal achievements, experience, and qualifications to show how good a fit you are to their program. With our experts help your resume will be able to show at a glance that you are the perfect match. Pediatric fellowship letter of recommendation writing: a good LoR can have a huge impact on your chances of being selected. Our specialists can help you to ensure that your letter is able to clearly recommend the applicant without raising any doubts in the mind of the committee. Their help will ensure that the letter is written perfectly. Fellowship application editing and proofreading: how your documents are written can be just as important if not more so than the content. Our editors and proofreaders are fully certified as well as highly experienced in this area. They will be able to quickly and effectively review your documentation to ensure that you present your information in the most impressive manner without any errors. It sure is fun to be a kid. To be honest, there is really nothing more nostalgic than seeing children at play. There’s just something undoubtedly wonderful about the way children play and how they bring us back to times long forgotten but enjoyed. However, it should be noted that the world isn’t really a safe place for children unless we make it so first. That’s why pediatricians, doctors who are experts on the health and well-being of children are in considerably high demand these days. A pediatrics personal statement can surely help in getting you a job as a pediatrician and help you get a chance for both a good career and helping the rest of humanity as well. Disease. Children naturally have slightly weaker immune systems than full-grown adults. After all, it is often children who contract diseases like chicken pox, measles, and mumps. That’s why it’s very important for children to be fully immunized before they are to be let out anywhere. Let’s face it, you probably have at least one of the diseases mentioned above when you were younger as well. Also, note that children are more vulnerable to certain chemicals and microbes than adults are and is why the venom of some animals like spiders. Injury. Children will be children. Yes, any parent can tell you this and also tell you how much of a problem it is to look after them. Children who can climb, who probably aren’t afraid of heights, will climb just about anything they can find. They will scale things like trees or even poles if they have access to them and you can probably guess what will happen should they fall off. Children, as they grow, are somewhat still getting accustomed to their bodies and are always likely to trip over their own feet, get burned with a stove or get a paper cut. Keeping children in safe places where they can be seen regularly. Putting away any kind of hazardous materials like toxic chemicals and sharp objects. Getting a child to participate in regular checkups to make sure that they are free from any kind of disease or injury. Why Should You Work with Our Perfect Pediatric Personal Statement Service? We know that what you really want is for your application to gain you an interview and that means it really must stand out. Our experts will do everything that they can to make sure that you will make an application that will get you selected for that all important interview. Direct access to your expert: so that you can be sure that your documentation will be written exactly as you expect and will reflect you perfectly. Experts that are qualified to help: your expert will be selected from our team and will hold a postgraduate degree as well as having years of experience making successful applications. Unlimited revisions: we know that everyone has very specific expectations from their writing and we will make as many changes as are required to make your personal statement perfect for you. Easy to access support: whether you have a question about our services or want to know the progress on your order our friendly staff are accessible 24/7 through phone or internet. Very affordable support: we show you just what we charge through our website and will never add any hidden charges to our highly competitive rates. Original work: your personal statement or other documents are never copied. We write using your information to your requirements. Your document will be supplied with a free plagiarism report. Free proofreading: simple mistakes are often enough to have your application rejected. We provide you with certified proofreading to ensure your work is perfect. Guaranteed satisfaction or your money back: if we cannot deliver what you expect on time then you get your money back, it’s as simple as that! So if you want a promising career, you can start by making a pediatric personal statement and making the best of it all. So start with your personal statement pediatrics now and see what you can do. If you have problems with pediatrics personal statement, contact us for professional assistance!